I’m REALLY looking forward to the movie. I can’t wait to see how the screenwriters and actors and director and everyone else involved are going to bring this story to life. AND OMG THAT MEANS MY BIRTHDAY IS IN 97 DAYSSSSS. AND 2012 is almost here and and and…breathe. Here’s the official trailer. What do you think? YAY or NAY? And more importantly, TEAM GALE OR TEAM PEETA???!! All credit belongs to VISOTRAILERS youtube channel. Back of book blurb: Sparks are igniting. Flames are spreading. And the Capitol wants revenge. Against all odds, Katniss has won the Hunger Games. She and fellow District 12 tribute Peeta Mellark are miraculously still alive. Katniss should be relieved, happy even. After all, she has returned to her family and her longtime friend, Gale. Yet nothing is the way Katniss wishes it to be. Gale holds her at an icy distance. Peeta has turned his back on her completely. And there are whispers of a rebellion against the Capitol — a rebellion that Katniss and Peeta may have helped create. 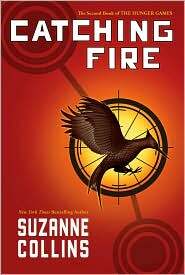 Review: I might have come to the Hunger Games party fashionably late, but this book sealed the deal for me. After reading book one, I couldn’t wait to run out and grab my copy to see what would become of the star-crossed lovers in the much anticipated sequel. Would the Capitol kill them? Would Katniss finally fall for Peeta? And what about Gale? So much drama, so expertly crafted. So worth reading. Collins was able to pull off a fantastic continuation of Katniss Everdeen’s story. Dare I say, flawless even? Collins masterfully combines suspense and science fiction with a touch of romance that leaves you wanting for more. I had doubts as to whether I’d be disappointed with the second book in the Hunger Games trilogy, but was pleasantly surprised with how it played out. It kept me up, turning the pages all night. In fact, I went ahead and bought book three, Mockingjay. Guess what? I loved that book too.